We are a small family run Plumbing business based in Rothbury,Northumberland. We cover a geographical area taking the vast majority of rural Northumberland and Coastal areas. 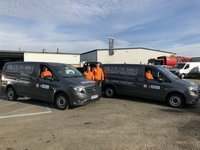 This business was established in 2008 by owner Chris Bilclough and grown our team from a vast experience of 4 generations of family involvement with the Plumbing trade. We mainly focus on new installations and maintenance of existing installations with particular specialist sanitary plumbing expertise. We are very proud to be associated with the 'Which' brand and hope to continue to get high ratings from satisfied customers. Please call us for a no obligation Quotation on any Plumbing works you may require. Chris responded swiftly to my query and came to fix the problem almost immediately. Work was carried out to an excellent standard and there was no mess left after the job had been completed. Thanks ever so much for a job well done, I will be using Bilclough plumbing services again. Consider the scenario where a change of heating system was included as part of a fairly substantial piece of building work to a residential property and it was 1 week before Christmas day. The builders had asked these guys to come in to install and commission a new heating system along with a new high pressure system. A week before Christmas when all through the house there was a certain amount of anticipation and worry that we wouldn't have any hot water never mind the issue where a new heating system meant a new shower was needed. These guys came in and delivered, simple as that. Professional job through and through and wouldn't hesitate to use them again or refer anyone to use them! 1: Telephone enquiry answered promptly. 2: All three installers were civil, quiet, hard working and clean workers. Chuffed! Had my boiler changed. Alex was very professional and got the job done quick and to a very high standard. Nice lad and easy to get on with and also charged a very reasonable price. Couldn't recommend him more. I can`t thank Chris and his team enough. Woke up to find water coming through the kitchen ceiling. Tried several numbers to get a plumber with no success, then rang Chris and he turned up in 15 mins, surveyed the problem and left a young man to deal with it. I am extremely grateful and will certainly use them again and recommend them whenever the opportunity arises. A lovely company to deal with. All work completed on time with minimum fuss. Workmen and equipment clean and tidy. Work area always left tidy at end of day. Bilclough Plumbing readily available with advice on insurance matter and carried out all insurance co requests promptly. This company obviously cares about its customers and reputation. Professional, courteous & great workmanship. Very pleased with the job. Well done lads. Would definitely recommend. Fast, clean, professional and charming. Would highly recommend this company. What an absolute pleasure to have brilliant workmanship combined with excellent professional attitude. A combination we can rely on.